Artist Hannah Hull has explored the local Longbridge businesses through her 'Art Service'. Through conversation she discussed the various businesses requirements, and created art works in response to them made during the same day. Working with the tools and materials they had brought with them, Hannah made and installed shop signage; submitted designs for a mural; and proposed early stage design approaches for a decorated shop door. This tablecloth celebrates the interwoven histories of Longbridge Car Factory, Bournville College, Cadbury Factory and Bournville Village. Featuring a selection of poignant, political and humorous archive materials, the purpose of the cloth is to stimulate memories and musings that interconnect these histories. 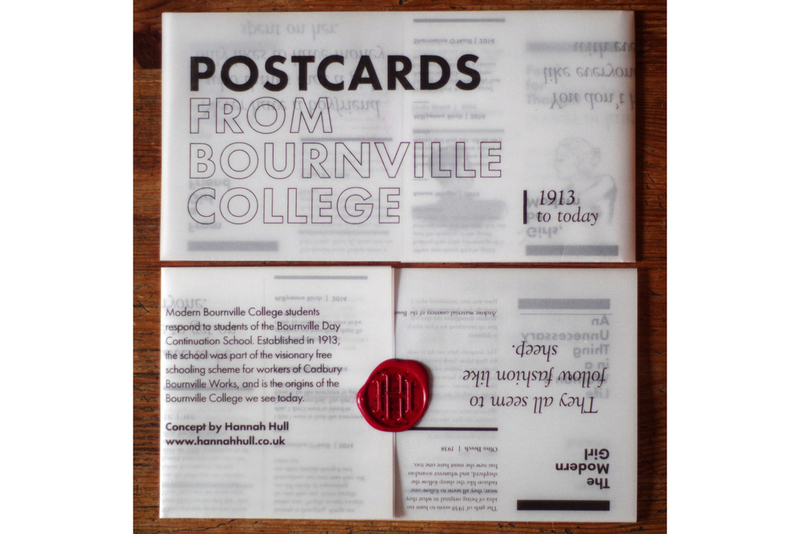 The postcards have been a result of modern Bournville College students responding to archive material produced by students of the Bournville Day Continuation School. Established in 1913, the school was part of the visionary free schooling scheme for workers of Cadbury Bournville Works, and is the origins of the Bournville College we see today. This fold out pamphlet digitally printed on vellum, hand folded with wax seal comprises of quotes from some of the original students of the school with responses from modern students. Covering age old issues such as relationships, fashion and identity, this booklet travels time to showcase the unique voices of young people across eras. 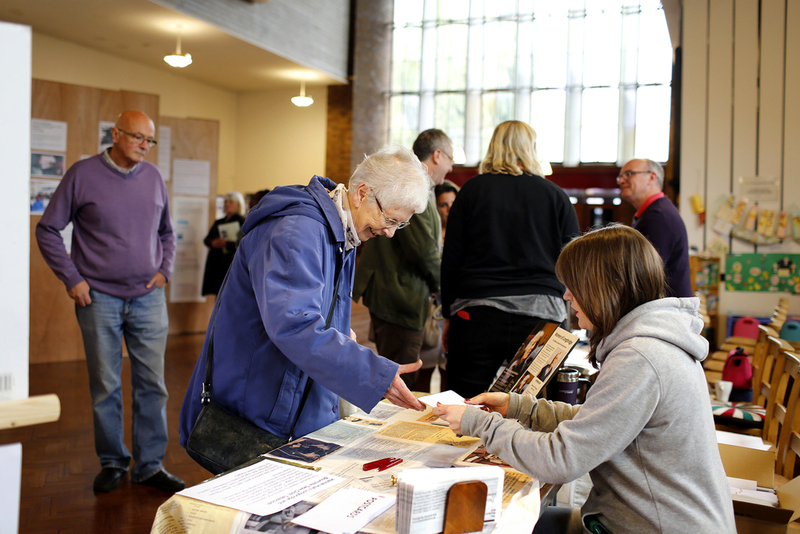 'Postcards from Bournville College' artist Hannah Hull handing them out at the LPAP Here & Now event at St John the Baptist Church. Installation photograph from the 'Women of Longbridge' exhibition. Women of Longbridge showcases and celebrates the overlooked stories of female workers of the now closed Longbridge car factory. The interviews document the changing attitudes towards women who worked in the male dominated environment. Covering several eras they also offer an insight into the changing approach to labour throughout the factory's life. Mo Noone from the series ' Women of Longbridge' by Hannah Hull and Stephen Burke. Launch of 'Women of Longbridge' exhibition, by Hannah Hull & Stephen Burke. All of the women who were involved in the 'Women of Longbridge' project were invited to take part in a discussion about the project and to talk about what is happening now in Longbridge and its history. Hannah Hull has been working with Nigel Clark a musician and former Longbridge Factory Worker. 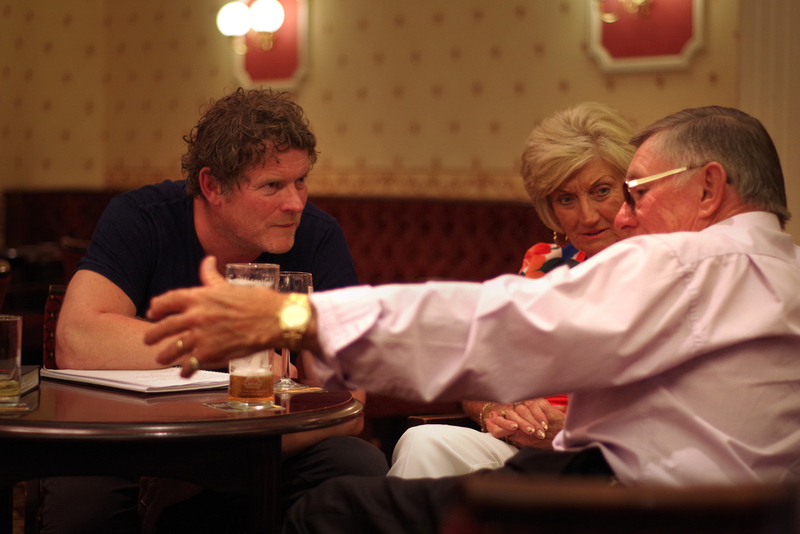 To create a song inspired through conversation and research into the people who worked t the factory. This song is to be released in 2016. Hannah Hull has developed a number of projects and interventions that explore Longbridge from a social viewpoint during the period of her residence and collaborated with Stephen Burke for the ‘Women of Longbridge’ project. Hull’s starting point was the archival material held by Bournville College, now sited in Longbridge. With Quaker roots connected to the nearby Cadbury factory, the College’s archival documents tell a particularly political tale underpinned by education for ordinary working class people and for women. 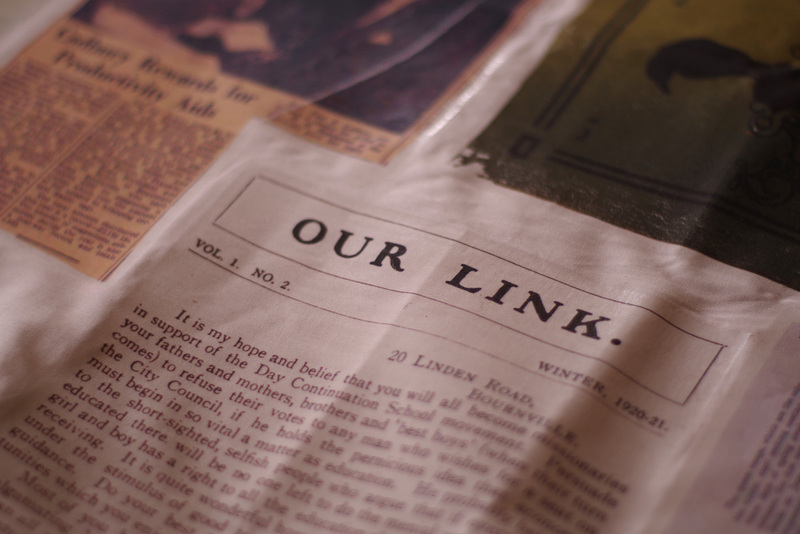 A student newspaper from the turn of the century that provided a voice for women has been used as source material to develop new texts with today’s female College students. What has surprised Hull is how many of the narratives and concerns of individuals are similar despite being separated by more than one hundred years. 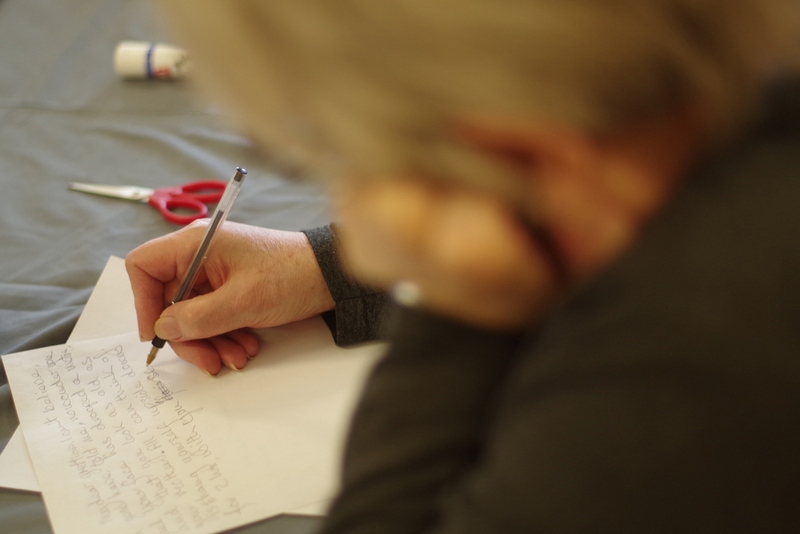 Creative writing workshops with College students and older women have facilitated discussions on feminism, fashion and relationships. Titled ‘Postcards from Bournville College’, Hull has produced a text-based artwork that has been distributed to residents sharing some of these women’s stories. The wax-sealed postcards offer advice to women across, as Hull describes it, this ‘collapsing of time’. Hull is also working on a project with musician Nigel Clark from the pop rock band Dodgy, who was employed at Longbridge car plant for four years. Together they are developing lyrics and music for a song looking toward Longbridge’s future via an accumulation and processing of real experiences. The music will be performed by local musicians and will eventually be distributed via a limited edition CD and online. Hull sees this project as allowing for a far deeper level of audience engagement, as her research is literally ‘embodied’ through the physical and emotional acts of singing and playing music. Another of Hull’s projects is exploring boundaries by engaging with local businesses on the periphery of the new development. In collaboration with other artists such as Cathy Wade and Rob Hewitt, Hull has visited small retailers – fish and chip shops and kebab houses, for instance – and offered her services as an artist for one day to these outlets. This generous and playful series of interventions has created conversations about creativity and art with people for whom this is not necessarily a part of daily life. Proprietors have revealed stories about drawing or other creative processes, have begun to think about art again for the first time in many years and some have asked Hull to complete specific tasks for them. As its manifestations and impacts are often extremely subtle – perhaps a change of perspective, a brief verbal exchange or the jogging of a memory – this has been a difficult project to document. Hull has described this approach as ‘social sculpture’. An interaction with people on a very personal level is at the heart of her ongoing practice. Hannah Hull makes situation-specific art and undertakes social research. Her practice catalyses dilogue and change for socially-excluded and at risk groups. Her approach is dynamic and responsive; an open mechanism that allows things to be made, reformed and challenged. The outcome of this process might be an action; it might be an object; or it might be words.